Join me and my church communication friends for a live show on Innovate 4 Jesus. I’ll be discussing where church communications is headed, along with some Certification Lab friends and show host Justin Blaney. We’ll discuss the Biblical ways to communicate the Gospel clearly, effectively, and authentically. Can I answer questions about your specific situation? Leave them anytime on the comments at i4j.org/future or via Twitter using #I4JLIVE. I’ll be taking questions from right now until Thursday’s show. Can’t join us live? We’ll still answer your question, and record it all at i4j.org! Who’ll be on this special broadcast? Mark MacDonald is senior brand strategist with BeKnownForSomething.com. With a teacher’s heart, he leads churches to “be known for something” so compelling that their congregations grow. Mark bring 27 years of experience including: Senior creative director at one of Canada’s largest agencies and PinPoint Creative in North Carolina. Phil Bowdle is the communications director at West Ridge Church in Atlanta, Ga. 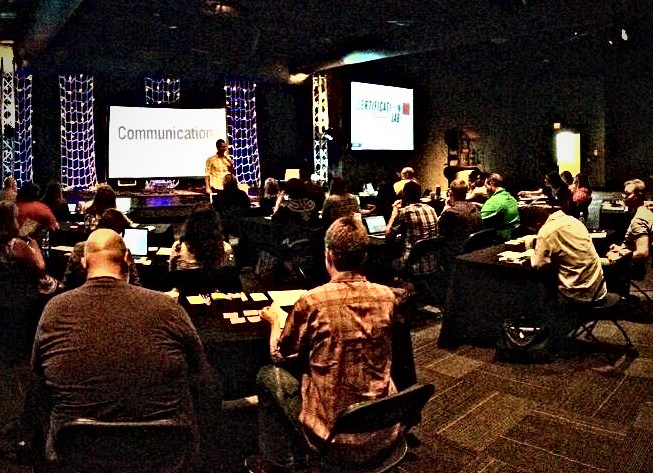 He is passionate about creating high-impact experiences through communications that lead people to Jesus Christ. Stephen Brewster is the creative arts pastor at Cross Point Church in Nashville, Tenn. His desire is for the church to regain its position as a leader of the creative frontier. Kelley Hartnett is the Director of Culture and Connection for The Way, a six-month-old church plant in the St. Louis area. Previously, she worked as the Director of Communications for one of the largest and fastest-growing congregations in Missouri, and she’s served as a resource for multiple churches seeking to improve their communication strategies. Jon Batarse manages Brander operations while also serving at St. Andrew’s Presbyterian Church, Newport Beach, CA, as the Minister of Communications for the past 8 years. Previously, he was a Marketing Director at Billabong USA. Gerry True has served as the communication arts pastor for the past six years with Max Lucado and Randy Frazee at Oak Hills Church, a large multisite church in San Antonio, Texas. He leads four teams of artists, including the Creative Arts communication team, who are passionate about building a movement. His enjoys discussing leadership and communication strategies and spending time with his wife and two teenagers exploring the Texas Hill Country.